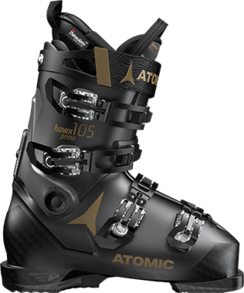 The Atomic Hawx Prime 105 is for the women ready to rip! Designed for medium-width feet, it offers the ultimate in performance for powerful skiing, with the kind of comfort that will have you rushing to get your boots on, not off. A full-featured boot based on Prolite – the revolutionary light construction with added reinforcements in key zones to reduce weight. It’s got plenty of adjustability thanks to the pre-shaped Memory Fit 3D Gold W liner, Power Shift, and the Memory Fit process. It all combines for that Legendary Hawx Feel – and the best days on the snow, ever. If you’re the kind of girl who skis hard, you should ski the Hawx Prime 105 S W.